Click chart to see in-depth premarket data. The bulls are back in charge, at least for the time being. 1. Another bouncy day? 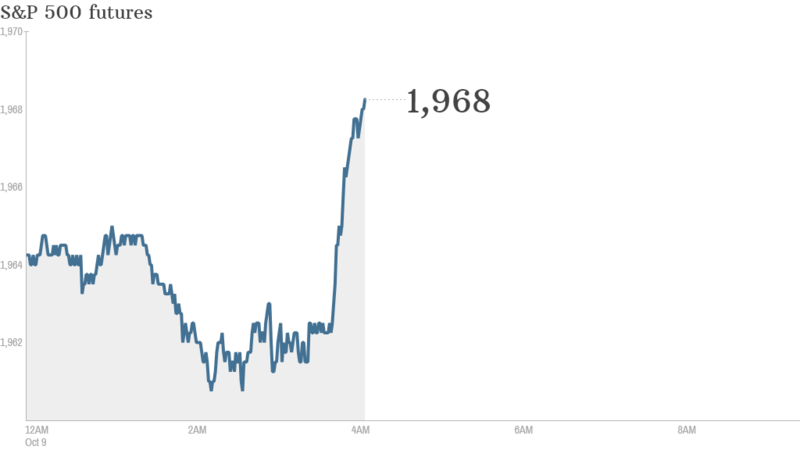 : U.S. stock futures were edging higher, and global markets were surging Thursday, following Wall Street's best day of the year. The Dow Jones industrial average rallied by 275 points -- its best performance of the year -- after a report from the U.S. Federal Reserve suggested it won't raise interest rates for a while. The S&P 500 jumped by 1.8% and the tech-heavy Nasdaq rose 1.9%. Wednesday's big gains came amid a stretch of elevated market turbulence. Stocks have swung dramatically on economic and policy concerns in recent days. And the CNNMoney Fear & Greed index is still showing investors are feeling very fearful. 2. Market movers -- Gap, Alcoa: Shares in the Gap (GPS) fell by roughly 8% in extended trading after CEO Glenn Murphy announced that he is stepping down. The company also said that monthly comparable store sales were flat and Murphy called the month "more challenging" than expected. Alcoa (AA) shares are climbing by about 4% premarket after the company announced much better than expected quarterly profits. The company has seen its shares surge by just over 100% over the past 12 months. 3. Earnings and economics: PepsiCo (PEP) will report earnings before the opening bell. The U.S. government will post weekly jobless claims data at 8:30 a.m. ET.